[WIP] Atelier Canvas - Custom Paintings v0.2 (BETA) - First download available! This mod allows players to take any image they want and turn it into a painting. 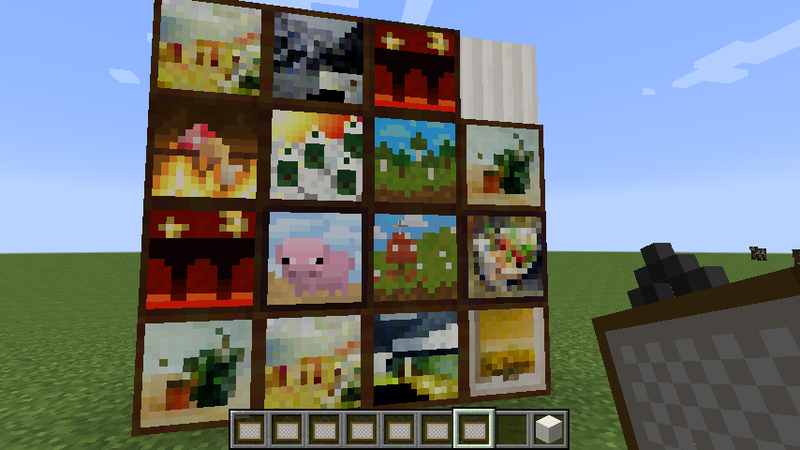 The paintings added with this mod don't replace vanilla ones and you can add as many images as you want! There were many mods before that added custom paintings, but I wanted to make one that was easy to use and didn't require the player to edit a complicated template file. This mod is currently in BETA, that means it works but still don't have all the features I want. If you need help or find any bug, let me know. Hope you enjoy it! NOTE: The mod does not come with any new paintings by default (yet). Pig_Rider: For making this reddit post and inspiring me to create this mod. - Source code on GitHub (GPLv3). - Bug tracker on GitHub. - Project info and downloads on Curse. It all began when I saw this post about custom painting on Reddit. I really liked the art style, it felt very close to the vanilla theme. The problem was I also liked the vanilla paintings and I couldn't have both at the same time. 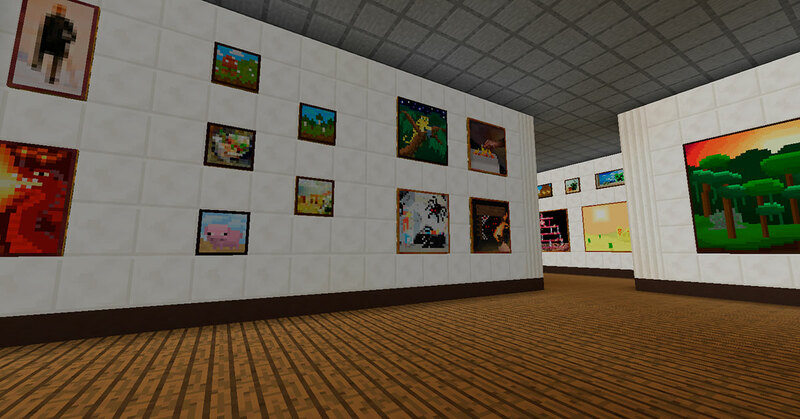 Even with the current resource packs, we only have a limited set of paintings. The solution would be mods. Many people created mods that adds more paintings (one of my favorites was Subaraki's Paintings ++), but most mods has the same flaws as vanilla. Some of you know that vanilla paintings are all inside 1 single 256x256 PNG file and every paintings is hard-coded. Even if you add more images to the PNG file, the game will only load certain positions. 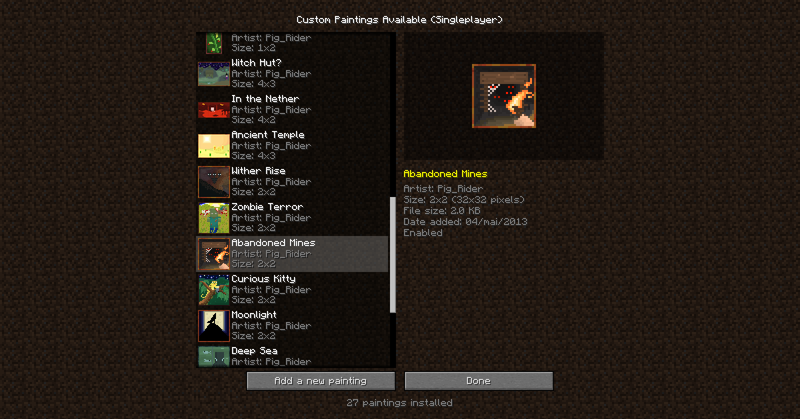 What many mods do is just add another 256x256 file filled with paintings and create a new item that will show them. It works, but if you want just 1 or 2 paintings, you must get the whole pack. If you want a custom painting not part of the mod, you also need to edit the PNG files. When Notch added maps to the game, I remember he said the new system would eventually allow players to create more types of content, like paintings. Many people in fact uses maps as a way to create custom images. People can create maps with custom images, share on multiplayer and there is no need to install anything. I wanted to use the same system for paintings. A few years later, I finally decided to try it and this mod was born. The name is a bit random, but themed around art. "Atelier" means workshop and "canvas" is where you do a painting. I just wanted to stay away from the classics like "CustomPaintingCraft", "ArtCraft" or "Mo'Paintings"
When the download link will be here, I'll download this mod. This looks very promising, when will it be out? Yeah, this is a project I wanted to work on for a long, long time. Finally I think I have the skill required to make it work. Sadly no ETA yet, for now I'm working on updating my Villager Tweaks mod, then I'll have to update Redstone Jukebox too. The good news is I plan on releasing beta versions of this mod, when I have something that won't cause crashes I'll update here. Location: Why u be stalker?! Will it be 1.8 only? I need a paintings mod for my horror map and I have no talent for editing the images, and I need all the paintings in the texture pack.... *kawaii kitten eyes* Will there be a 1.7.10????? I could make an NPC you for lee credits~! I make maps... Any requests, suggestions or something? Good luck on your map, I'll let you know when I have something playable. Recently I started working in this project again, I have the concept pretty well developed and also did some great progress on the coding. 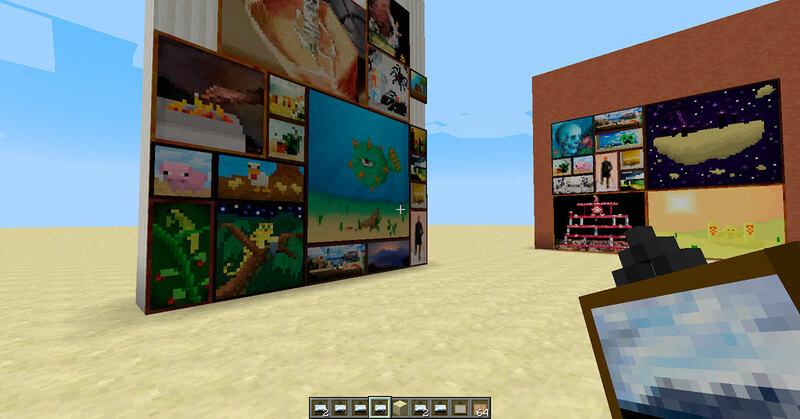 Here is a screenshot of the config GUI, where a player can see and manage all their custom paintings. At least for singleplayer, I want people to be able to add new paintings in game. I want to create something where the player don't have to manually edit the config files. Wow, looks really good! I hope you finish this since this has been raging since 1.0.0! Some good news, over the last week I made much more progress than I antecipated. Currently the mod allow players to import images from the file system, in game (like resource packs) and accept images of any size, from 16x16 to 64x64 pixels. The paintings render without any major bugs I can notice. For now, it will only work in singleplayer. There are still issues to fix before it's playable, but I think I'll be able to release a working beta download soon™. Thanks to people giving support. Another progress update, in video form. This project is very close to a BETA release. Main post updated, a download is now available. It's still BETA, but should work fine. Now I'll make a wiki for it and a tutorial on how to install the paintings. I'm following this. I tried it some but I didn't know how to add my own paintings. Having the power to add own custom images is on my mod wish list since I got bored with the default paintings (and that was ages ago). This mod looks super promising, Keep up the good work! I look forward to the point when I can add and remove paintings from inside the game. Can you please provide a pair of example array entries so I can see the format used for each painting and how each array entry is formatted and separated from each other? I would really appreciate it and it would allow me to start building a custom painting library in the meantime. Downloading as I type ---- if this actually does what it looks like it'll do, I'm FedExing you cookies or something, man. Okay so, threw the mod in, minecraft started just fine, was able to load a new world (though it took quite a bit longer than usual, oddly). I know this is obviously in beta and you'll be ironing out kinks for a while, so here were a few little things I figured I'd mention -- and sorry if any have either already been mentioned or if you're aware. 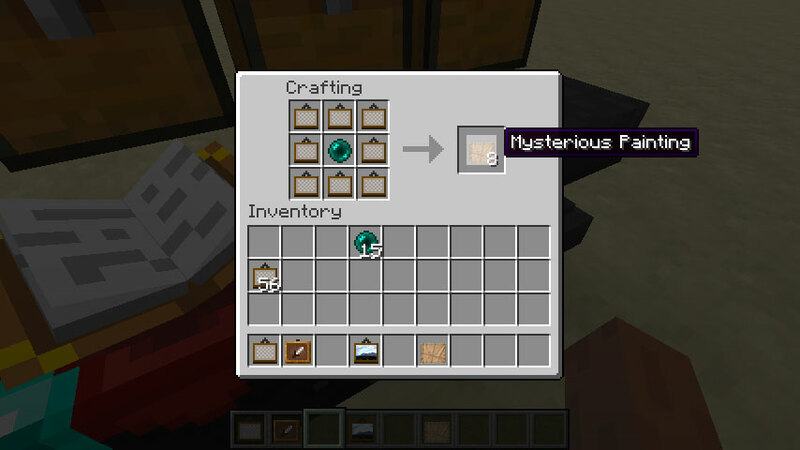 So, there are 3 items for your mod in my NEI display. On creative (because also, by the way, I was unable to craft any of the canvases in survival), I spawned them in. The Custom Painting did nothing *but there are two different versions, same name, just that the second one has a number "1" behind it. When I tried placing the Mysterious Painting, nothing happened, but the item itself in my hand changed into a Custom Painting. Also, you have instructions on Curse for how to import custom images, but I was unable to do so at all. It's a fantastic mod concept though. Sure, there are other mods that add paintings to the game, but not in this manner. The way you're making it possible and user-friendly in this mod is superb. This mod is not working. The developers have already abandoned it. When you have the mysterious picture, nothing happened. Do not download this mod, it's a great concept but it's not working, if you want to waste your time with this. Go ahead. Other than that use BilbloCraft.